We have the ultimate family vacation destination in SE Wisconsin and it is only available for selected summer weeks. If you are a family of 4-6, looking for a great vacation location, you need to check this out. Located in Racine, Wisconsin, on the shores of scenic Lake Michigan. Right across the street from North Beach, a top-4 freshwater beach in the midwest, according to USA Today. This 1920’s two-bedroom home is completely modernized and eclectically furnished. Two bedrooms with comfortable sleeping for five (two queens and a twin daybed), and a couch for the sixth. The views are stunning, you can see the lake unobstructed, two lighthouses in the harbor from the front living and dining room. It is amazing, we love this home and wanted to make it available for a select few to discover our part of Wisconsin. We are located two short blocks from the Racine Zoo. A quaint, family friendly, very clean, social gathering spot. 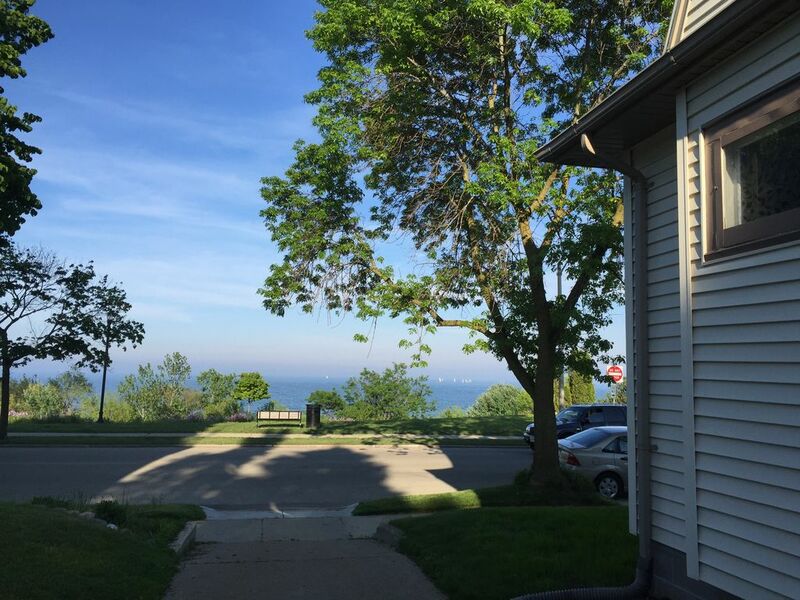 Also on the shores of Lake Michigan, it is the location of the Animal Crackers concert series, bi-weekly Wednesday night free music performances during the summer. Spend a few days or a summer week lounging on the beach during the day, letting the kids play on the life-guarded beach. Get on the water with your boat or take a fishing excursion out on the lake. Ride bikes along the lakefront bike path and check out some live music down at the beach oasis. For baseball fans, we are within 30 miles of Miller Park and only 75 miles to Wrigley Field in Chicago. Either one is a short day trip. In the evenings you can explore the nearby local restaurants and several new and established brewpubs. We can provide suggestions and make your reservations. This is our second home in Racine, and we live nearby. Strict occupancy limit of six people applies. We do not allow parties which would harm the property and irritate the neighbors. If you are a responsible adult with a family and want to enjoy this property we'll welcome you. Send me an email with any questions, I’ll respond promptly. We were pleasantly surprised by the interior of the house. Pictures of this house does not do it justice. Very comfortable living area, nice open dining room. Windows in both rooms overlook the lake. Kitchen adequate, has pretty much everything you need. Nice that there are 2 bathrooms, one on main level and one upstairs with the bedrooms. Beds were comfy. Home was spotless. Randy was very accommodating and friendly. Pictures don’t do it justice! Great house with great views! Randy and his wife met us upon arrival. The house is set up perfectly and has everything you could need. The beds were comfortable. Right across from the beach- so beautiful! Parking was so convenient and we were close enough to everything in Racine. Great property. Clean. Spacious. Great access to local attractions. House was clean. Well organized. Fully stocked. Worked great for our family of five. Couldn’t have asked for more. We were looking for a beach vacation home. The beach in front of this house was one of the best I have seen. It is cleaned every morning. The park behind the beach was well-used by families. There was a walking path along the beach front. The zoo was less than 1/2 a mile north and my 2 year old enjoyed feeding the giraffes. About a mile south is the downtown Racine area and the marinas. There is a great playground on the south side of the beach. Milwaukee was a 40 minute drive and we spent a day going into the public market and walking along the river front. There is a road in front of this house that I was worried about with a toddler, but the road was never very busy and there were no speeding cars. Randy was always very responsive when we contacted him and was a great host. My family stayed here for 4 days and we loved the house, the beach, and the location. It is a great place for families that like to just relax on a sandy beach all day. Families up to six persons only. Extra guests will void agreement.